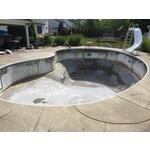 Inground Swimming Pool Vinyl Liner Replacement Services Buffalo NY | Pools Unlimited Inc.
INGROUND SWIMMING POOL VINYL LINER REPLACEMENT SERVICES. 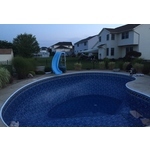 Does your pool need a face lift? 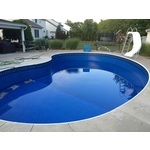 Pools Unlimited's service technicians are experts in vinyl liner replacement for inground swimming pools. With almost 30 years of experience, you can be confident in our ability to measure your pool for a new liner, and get it installed correctly. 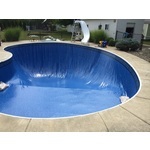 We offer liner replacement services throughout Western New York. Please call us today with any questions or for a free estimate. Call us at 716 677 4100. 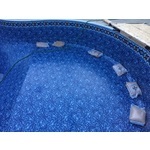 Pools Unlimited recommends inground swimming pool liners from McEwen Industries. McEwen liners are manufactured to exacting standards from the finest quality virgin vinyl combined with UV inhibitors, bleach resistant inks and fungicides to give your new liner the longest life possible. 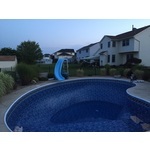 For almost 30 years, Pools Unlimited has been installing new pool liners all over Western New York. With hundreds of installations, we have the skill and expertise to get this work done properly. 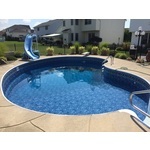 Below we've answered some commonly asked questions about inground pool liner installation. 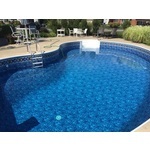 How much do inground pool liners cost to replace? 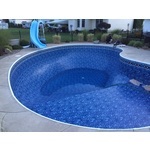 In general, an inground pool liner replacement cost is between $3000 and $6000. There are a lot of factors which go into this cost including the size of the pool (12 x 20 vs. 25 x 45); the type of liner chosen (plain vs. print; 20 mil vs. 27 mil); the pools' shape (rectangle vs. freeform); the structure (steps vs. no steps vs. steel steps covered with the vinyl liner); the pool base (portland cement vs. vermiculite). In addition, the number and make of the skimmer(s), return(s), main drain(s), stairs, light(s), pop up cleaners, etc... will add to the cost because we change out the face plates and gaskets of these items to give the pool a "new" look and to prevent water leaks from old worn out gaskets. 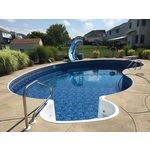 How long does it take to replace an inground pool liner? 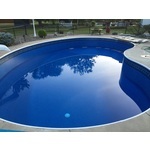 We measure each pool individually and have the liner custom manufactured for your pool. This assures a proper fit of the liner and the longest liner life expectancy. 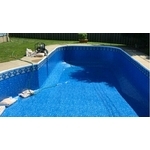 (An off the shelf liner placed in your pool may have excess material which will result in wrinkles; or it may be short and be stretched more than recommended resulting in the material being thinned out). The measurements are sent to the liner manufacturer for input into their computer system. Here they check for any discrepancies in the measurements to make sure no mistakes are made in the manufacturing process. This process takes about a week to complete. Once the measurements are confirmed, the liner is manufactured which takes approximately 3 to 5 days depending upon the backlog at the manufacturer. Once the liner is complete, it is shipped to us which takes another couple of days. Once we have the liner in our hands, we prepare for the installation. Weather permitting, we begin the installation which will take between 2 and 3 days depending upon the size of the pool, the condition of the pool, the condition of the pool bottom, and water pressure. 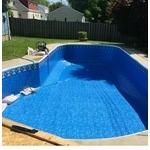 On the first day the old liner is removed, the pool bottom is fix/cleaned, the new liner is installed and vacuumed in, and the filling begins. On day two, depending upon the fill rate, the skimmer and returns, and stair kit can be cut in. Once these are cut in, it is just a matter of filling the rest of the pool. Sometimes the water pressure is not strong enough to allow us to cut the stairs, returns and skimmer until the third day. How long do inground pool liners last? 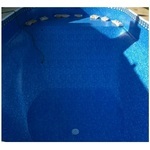 The life expectancy of the liner can vary from pool to pool. I have seen liners that need to be replaced in as few as 8 years due to bad water chemistry which caused the liner to wrinkle (low pH and alkalinity will cause this); and I have seen liners last over 20 years. The average seems to be approximately 15 years. What is better, a 27 mil liner or a 20 mil liner? In my opinion, the thickness does not matter. Anything that is sharp enough to puncture a 20 mil liner will most likely puncture a 27 mil liner.The major cause of liner failure is not due to punctures, but improper water chemistry and the use of oils and lotions in the pool. These lotions and oils accumulate at the water line and are then baked into the liner by the sun causing the liner to dry. The use of an enzyme in the water will eliminate the "soap film" line caused by the oils and lotions and make the liner last longer. A second consideration is the shape of the pool. If your pool has rectangular corners or small radius corners, the 20 mil liner will stretch into these tight areas better. 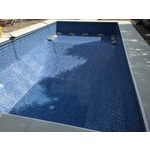 The thicker liners will not stretch back against the base of the pool or the walls and will leave a gap behind the liner. 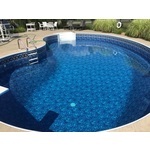 When is the best time to install an inground pool liner? The best time in the northeast is from mid June thru the end of August. 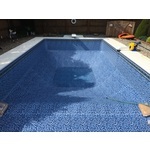 The reasons is that the ground water table is lower at this time which reduces the likelihood of ground water damage to the pool base when the pool is drained; and the weather is warmer which softens the vinyl making it more pliable so it stretches into shape resulting in a better fit. 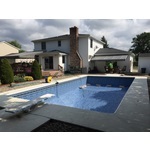 If you have any additional questions about inground pool liners and / or installation of inground pool liners, give us a call at 716 - 677 - 4100 or complete and submit the following form. Thank you. The liner installation process...in pictures. Here are some pictures that show the process of replacing an inground swimming pool liner with a brief description of each. 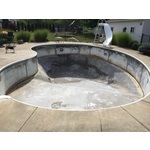 Picture #1 is of the pool with the liner removed. On the day of the liner replacement, we drain the pool and remove the old liner by cutting it up into pieces and hauling it away. 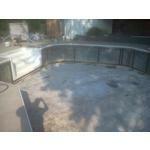 This is a picture of the pool with the liner removed. Once the liner is removed, we have to inspect the steel walls to make sure they are in good shape - no rust, burrs, etc... that might damage the new liner. We scrape the walls down to remove any dirt or other debris, and then wash them down after. Once the walls are finished, we start on the pool floor. We check the floor for major imperfections and repair those as necessary. We have to make sure there are no spots where the bottom is cracked and loose pieces of the concrete base can come out when the pool is filling. 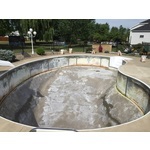 If a loose piece of concrete or a stone comes out, and gets under the liner, the pool would need to be drained, the liner pulled back, the stoene removed, the liner re-hung, and then the pool refilled. In this photo, you can see that the slopes of the pool have been repaired - where they were cracking. When the floor is completed, we then broom and vacuum the entire bottom of the pool. 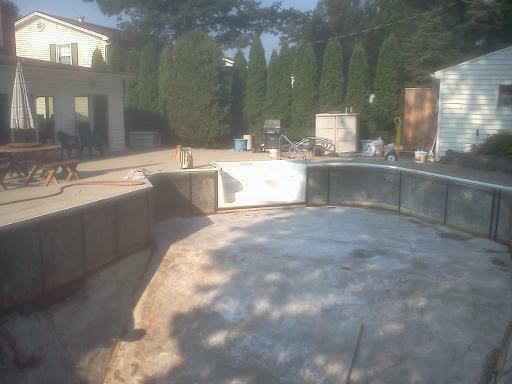 This is not a great picture, but the crew is finishing up the pool bottom. The pool floor was swept into the deep end and they are using a shop vacuum to vacuum up all of the dirt and debris. On this installation, we were fortunate that we did not have a ground water problem. In some cases, if you are in an area with a high ground water table, water from the ground can run or seep into the bottom of the pool when the old liner is removed. That running water can cause erosion of the pool bottom and require additional work to stop the water and repair the eroded bottom. 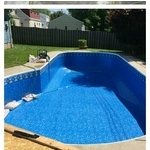 Here we have the liner hung and vacuumed in, and the pool is filling. You can see that the main drain has been cut in. 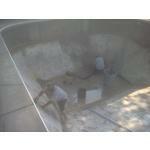 The other fittings - returns, skimmer, and stairs get cut in after the water is up higher in the pool. We have placed sand bags in the shallow end of the pool to hold the liner back against the wall. This prevents the liner from "slipping" into the deep end of the pool and causing excess stretching and pull on the liner at the bead (where the liner attaches to the wall) in the shallow end of the pool. At this point, we just let the pool continue to fill. 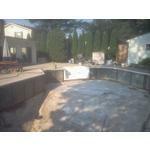 Once the water is into the shallow end of the pool, we cut the returns, skimmer and stairs in. The whole process takes a couple of days depending on water pressure. Once the pool is filled you adjust your balances and start swimming! "Your guys did an awesome job. The new pool liner looks great." "Ron -Thank you and your staff for a job well done on the safety cover. See you in the spring - Happy New Year!" “Ron, Thank you for helping us out with the hot tub. It's so nice to be able to use it again! Best wishes for a wonderful holiday!"